Imagine a music-lover turning the radio on. There is a programme of classical music. After a few seconds, the music-lover recognizes the fragment just heard as being a part of the Funeral March in Beethoven’s Eroica. The sequences of pitches, durations and timbre has acted upon the listener in a fashion similar to that of familiar features in a face we know. If listeners are also musically literate, they could even write down the notes they hear, and the result will be similar, if not equal, to the score seen by the orchestra conductor. None of these experiences could apply to a broadcast of John Cage’s Number Pieces. The instructions given by the composer to the interpreters in the “score” can originate a number of performances whose aural features will be very different from one another; moreover, nobody who is not acquainted with the composer’s notation could “transcribe”, or derive, the original score by simply listening to one execution. This is because the score of John Cage’s Number Pieces has a dramatically different concept than that of the Eroica, and purposefully so. This series of works, comprising between 40 and 48 pieces depending on the criteria adopted, was written by John Cage (1912-1992) in the final years of his life, starting in 1987. In Cage’s own words, “Another series without an underlying idea is the group that began with Two, continued with One, Five, Seven, Twenty three, 1O1, Four, Two2, One2, Three, Fourteen, and Seven2. For each of these works I look for something I haven’t yet found. My favorite music is the music I haven’t yet heard. I don’t hear the music I write. I write in order to hear the music I haven’t yet heard”. While the label Number Pieces is not Cage’s, as it was created by James Pritchett, the titles of the individual pieces are interestingly fashioned. Each comprises a number written in full (such as One or Two) plus a superscript in digits. The first number indicates the quantity of performers involved, while the superscript identifies the order of composition: thus, One6 is the sixth piece written for one performer among the Number Pieces. As maintained by Robert Haskins, “Cage liked [these] titles because they were like the simple clothes he wore, the style of which never changed from day to day”. If the quantity of musicians is clearly and neatly transmitted in the individual titles, the quality of the instruments played varies dramatically, and ranges from the most classical of the classical instruments (such as the violin and piano played in this Da Vinci CD) to the exotic sounds of the Japanese shō or of the rainsticks. [John Cage, Composition in Retrospect (Cambridge: Exact Change Books, 1993), 34–35.] The definition of the time brackets’ pitch content was delegated by Cage to external forces. In the first Number Pieces, written between 1987 and 1989, the composer employed the I Ching, an ancient Chinese divination text, in order to determine certain compositional features; in the second period (1989-1992) this task was entrusted to a software, TBrack, developed by Andrew Culver, with whom the composer had already cooperated in the past. This choice was due primarily to Cage’s philosophy of composition, about which we will discuss shortly, but also to contingent reasons, such as the quantity of commissions he was receiving in his last years, and the consequent need to develop a compositional technique suited to these multiple demands. The presence of flexible time-brackets (especially in works for more than one player) implies that the aural result of the pieces will be “variable” indeed from one performance to another. The overlapping of time-brackets produces what Cage described as “very complex eventualities, as what happens in life when you get involved in two things at the same time. One then has to choose whether to stop or continue…”. The implications of this for the performer are summarized by Glenn Freeman, an acclaimed interpreter of Cage: “This performance is only one realization. For almost all the number pieces, the notes will always be the same and in the same general order of appearance, no matter who realizes the work. The notes will fall at different times and have different durations, based on chance, but the piece is always the same length of time”. This variability was deliberately chosen by the composer: as Haskins points out, “At the end of his life, Cage wanted his music to be like writing on water—an act that left no traces”. Cage’s choice was determined by his aesthetics, which increasingly favoured Far-Eastern philosophical approaches to time and creativity over the Western attitude which is more frequently found in “classical” music. Against the idea of “time-as-duration” which inspires the traditional notation of beats and rhythm, Cage wanted the feeling of “time-as-flowing” to pervade his works (as in McLuhan’s famous definition); ironically, however, this seeming freedom was pursued by the use of stop-watches for coordinating the various performers, thus creating a marked contradiction between the quest for a “natural” time and the means for obtaining it. A similar contradiction arises in the treatment of pitches and elements of traditional harmony. While the “naturalness” of the Western tonal harmony was vehemently denied by Cage (who famously argued with his teacher Arnold Schönberg on these topics), undeniably some form of “harmony” is discernible in the Number Pieces (for instance, in those included in this CD). Cage himself was conscious of this, when he stated: “Harmony means that there are several sounds… being noticed at the same time. It’s quite impossible not to have harmony”. Thus, Cage’s works are a statement of intents against some of the most cherished values of the Western tonal music, such as the organization of time and harmony with a purposeful teleology, a narrativity, a consequential causality; these he countered with the Eastern principle of “interpenetration”, which he obtained through the use of overlapping time-brackets. In consequence of this subversion of the traditional values of composition, also the relationships binding composer, work and performer(s) are transformed. As the preceding quote from Composition in Retrospect shows, Cage was more interested in the process of composition and performance than in the result, in the object produced; this is what makes the “facial features” of many of his works unrecognizable to the casual radio listener, and what allows certain aspects of his oeuvre to be described under the label of “open work”, as studied by the Italian philosopher and writer Umberto Eco. Against the idea that the composer’s genius makes the artwork, Cage famously maintained: “If you celebrate it, it’s art, if you don’t, it isn’t”. Thus, Cage’s Number Pieces may be analysed only at a higher level than that of the pitches and durations studied by classical music theory; scholars such as Alexandre Popoff have employed statistical analysis and stochastic studies in order to highlight the “meta-structure” underlying these works, and the basic features which may be non-apparent when listening to them. 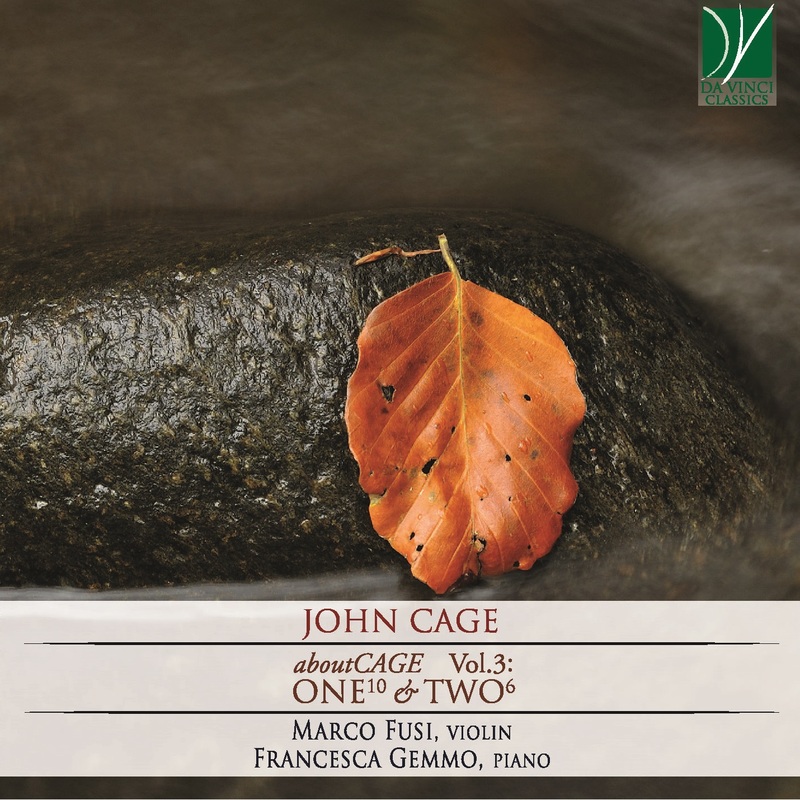 The two works performed in this CD both date from Cage’s last year, 1992, and were premiered posthumously. Two6, written in April, was performed in December by the two dedicatees, violinist Ami Flammer and pianist Martine Joste in Orléans, during a recital titled John Cage meets Erik Satie: the programme fascinatingly highlighted the relationship between the two composers, particularly by juxtaposing Satie’s Vexations with Two6, in which Vexations is used as part of the musical material. Fragments from the same work by Satie were also employed by Cage in Four3, thus linking two of the Number Pieces though their common reference to one of Cage’s favourite composers. In turn, One10 for solo violin is strictly connected to another of the Number Pieces, One6: both were written for and performed by the violinist János Négyesy, in a fascinating event of multidisciplinary art. While Négyesy was playing, in fact, an ice sculpture by Mineko Grimmer was slowly melting, and the stones which had been frozen into it gradually fell into a pool, thus providing a visual and aural frame to the performance of the piece. In contrast with One6, which consists entirely of extremely long notes, sustained almost agonizingly by the violinist, One10 explores the use of harmonics. Once more, therefore, Cage explores the field between nature and technology: “time-as-flowing” against “time-as-duration”, the ambiguity about “harmony” and the “natural” origin of harmonics, the use of computer software and stopwatches, the liminal position between prescription and anarchy, the fascination for the void by a composer whose life was full of experiences and experiments. These contrasts should not be solved: they are, in fact, one of the most distinguishing features of Cage’s aesthetics and of his artistic output, and one of the aspects for which he will be remembered. Francesca Gemmo is an italian pianist and composer. Her focus on experimentation and improvisation has encouraged collaboration with influential artists such as Alvin Curran, Brunhild Meyer-Ferrari, Steve Piccolo, Walter Prati, Giancarlo Schiaffini and Elliott Sharp. She has performed in Italy and Europe (Sale Apollinee di Venezia, Centre Le Phenix di Friburgo, Konzerthaus di Weimar, Fondazione Mudima di Milano, Museo del Novecento di Milano, Teatro Arsenale di Milano). Her compositions have been performed by Divertimento Ensemble, Irvine Arditti, Trio Matisse, Luca Avanzi, Sergio Armaroli and Sergio Scappini; moreover, works have been commissioned by prestigious instrumentalists such as guitarist Magnus Andersson and saxophonist Daniel Kientzy. In 2017 for Ars Publica she recorded the unpublished work (1a execution absolute) "Grandi Numeri" by Sylvano Bussotti with Improvviso Fantasia directed by Giuseppe Giuliano. In April 2019 will be released a recording project for solo piano improvisation published by Dodicilune. She has published several scores (Salatino Edizioni and Berbèn), and essays on musical and didactic subjects (Tangram Edizioni Scientifiche, Padus Edizioni). Marco Fusi is a violinist/violist, and a passionate advocate for the music of our time. Among many collaborations with emerging and established composers, he has premiered works by Billone, Sciarrino, Eötvös, Cendo and Ferneyhough. Marco has performed with Pierre Boulez, Lorin Maazel, Alan Gilbert, Beat Furrer, David Robertson, and frequently plays with leading contemporary ensembles including Klangforum Wien, MusikFabrik, Meitar Ensemble, Mivos Quartet, Ensemble Linea, Interface (Frankfurt), Phoenix (Basel) and Handwerk (Köln). Marco records for Kairos (Pierluigi Billone – ITI KE MI / Equilibrio.Cerchio), Stradivarius (Salvatore Sciarrino works for violin and for viola; John Cage, Freeman Etudes; Scelsi Collection Vol. 7), Col Legno, Geiger Grammofon. Marco also plays viola d’amore, commissioning new pieces and collaborating with composers to promote and expand existing repertoire for the instrument. A strong advocate and educator of contemporary music, he lectures and workshops at Columbia University, University of California – Berkeley, Basel Musikhochschule, New York University, Boston University, Royal Danish Academy of Music – Copenhagen, Cité de la Musique et de la Danse – Strasbourg, University of Chicago. Marco teaches Contemporary Chamber Music at the Milano Conservatory “G. Verdi” and is Researcher in Music Performance at the Royal Conservatoire of Antwerp.